The TH-3060-UF is a wall mounting solution for the latest generation of consumer LED, LCD and Plasma displays. If you have a 32" or larger flat screen TV that you wish to mount flush to a wall then this may be the product for you. The slim profile provides a sleek finish while quality construction ensures a lifetime of worry-free operation. 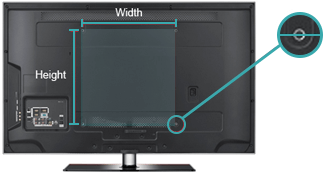 Universal VESA support ensures compatibility with a large number of displays. A mounting plate affixes directly to the wall while brackets attach to the display using screws included in the pack. After cabling the display is simply lifted and clicked into place. The wall plate incorporates a spirit level and slotted holes for easy alignment while the brackets allow for horizontal adjustment post installation. A latching system on the brackets incorporate sash pulls for easy display release. The sashes feature a folding design so they can be safely hidden beneath the display.